Four military planes attacked an arms factory in Khartoum, a Sudanese minister said on Wednesday, blaming Israel for the air strike. 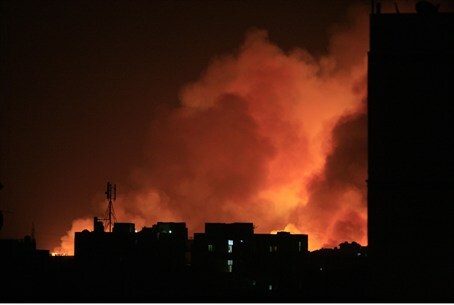 Four military planes attacked an arms factory in Khartoum where there was a huge fire overnight, a Sudanese minister said on Wednesday, blaming Israel for the air strike. Bilal Osman told a news conference. "We reserve the right to react at a place and time we choose,” he said, adding that evidence pointing to Israel was found among remnants of the explosives. The explosion at the military factory in Sudan's capital before dawn Wednesday sent detonating ammunition flying through the air, causing panic among residents, the official news agency and local media reports said. Officials said there were no reports of deaths, although some residents had suffered from smoke inhalation. In 2009, a convoy carrying weapons in northeastern Sudan was targeted from the air, killing dozens. It was widely believed that Israel carried out the attack, as the shipment was headed to terrorists in the Gaza Strip, who would use them against Israeli civilians. Israel never confirmed or denied the accusations. Sudanese parliamentarians denied that weapons were transported in the area. In 1998, the United States cruise missiles bombed a Khartoum pharmaceutical factory suspected of links to al-Qaida in the aftermath of the terror group's bombings of U.S. embassies in Kenya and Tanzania that killed 224 people. Sudan has been a major hub for al-Qaida terrorists and a transit for weapon smugglers and African migrant traffickers.